Blessings: Newt I hope you're reading this! For me, the greatest blessings have always been the people who come into my life. Some of them stay. Some of them go. A few became lifelong friends; others were around for a few years. Many of them are momentary or casual encounters, such as retail employees, clerks in offices, medical personnel at hospitals. I have blogged before about two of these people. Tonight I want to write about another one. He works part-time at the ALCO Store here in Houston. He also works at Auto Zone.Nothing wrong with his work ethic! Twice now, during my shopping trips I have had the opportunity to talk with him. He's a young Black with children. I haven't asked his age, but I'd guesstimate it in the 27-32 age range. He's cheerful, considerate and extremely helpful. Tonight I ventured into ALCO alone, so he helped me take my purchase out to my car and load it in. We were chatting about one of the items I bought, and I discovered he was born with a heart murmur. I told him of losing my father at age 46, just days after my 10th birthday and how it tore my life apart. I begged him not to eat so much salt, since heart disease in Blacks takes more of them at earlier ages than it does Caucasians. Then we chatted a bit more about nutrition and its importance in combating heart disease. That conversation took a glissade into living each day as if it were your last. We both felt that that attitude goes a long way toward putting things into perspective. It's very hard to remain depressed, angry, or selfish if one asks one's self each day "If I die today, how will people remember me?" It's also hard to rush through life oblivious to others and to the beauties that lay around every corner, whether that beauty is the laughter of a child, a carefully tended flower garden in a run-down area of town, or something else. "I try to do God's work every day," he said. Now in one of my smart mouthed moments, or with someone who knows my warped sense of humor well, I might have retorted "So what's wrong with God today that He can't do his own work? He call in sick again?" Instead, I commented that we never know just what it is that God wants us to do every day, or in our lives. We may think we know, but only God knows. Maybe it's a kind word to a stranger badly in need of kindness, something seemingly inconsequential. The conversation ended with him telling me to take care of myself because, he said, "I love seeing you up in here, moving and smiling. You have a beautiful smile." Each of us has an opportunity to be a blessing to someone each and every day. It need not be a grand gesture. Nor need it wait until Christmas when one is feeling generous. Hold the door open for a person in a wheelchair, even there is someone pushing them. (You might be surprised how hard it is to open a door and push someone through, even the person being pushed is helping.) Take a couple of cans of food to the local food bank every week. People have to eat all year long. Order an extra packet of vegetable seeds and send them to a community garden in an "urban desert." If you see someone at the gas station driving an old beat up car, wearing old clothes, pay for an extra gallon of gas for them. You can think of a 1000 ways to do little things for people, at little to no cost to you. Suspend your judgment about whether they "deserve" it. Do you think God withholds His grace because "(s)he didn't deserve it?" If that question gives you a problem, perhaps you could look up "grace" in a dictionary and rethink your answer. The ITO Club stands for "I'm Totally Oblivious." It consists of people who move their days without ever engaging their minds on the people and situations around them. I came up with this idea while driving in Christmas shopping traffic. You know, the drivers who block exits from shopping centers, streets where people are waiting to turn on to the freeway feeder, back out without looking to see if anyone is coming. Those people. Some days, all of us belong. Each of us can have a day so crammed with errands and minor crises that we cannot get our mind off them long enough to look around and see what is happening around us. Last Saturday at IKEA, I had a particularly disturbing encounter with a member of the ITO Club. This woman and what appeared to be her mother were in line in front of us. Mind you, on such shopping expeditions, what we do is form a little train with my wheelchair and the shopping cart. 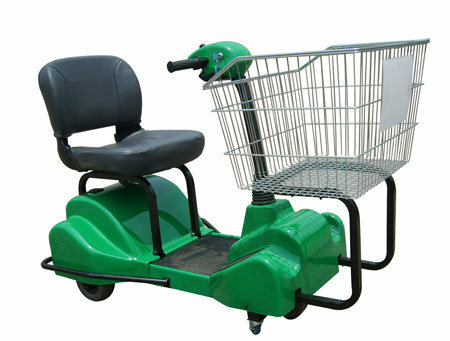 I hold on to the cart handle and put my feet on the rail beneath it and steer it by exerting pressure on the side we need to turn. My husband is the "engine in the rear" who provides the forward momentum. One consequence of this arrangement is that when my bag (it's not a purse, more like a beach bag) rides in the child seat. Well, guess what? I cannot see OVER it. When the cart is full of stuff, I cannot see under it either to see what is directly in front of me. Another disadvantage is that if I turn to speak to my husband without shouting over my shoulder, occasionally my legs will shift and scoot the cart forward a little bit. This is what happened Saturday. I bumped the back of the lady's big yellow shopping bag, completely by accident. Ron said, "don't hit that lady's rear." I immediately pulled the cart back with my feet and apologized. In a few minutes, the lady and her mother stepped forward, and I took the opportunity to stretch my legs out a little. I have this hinky knee and when I keep it bent up for a long time, it starts whining. What I hadn't seen was that when the lady stepped forward, she had set her bag on the ground BEHIND herself. So I bumped the cart wheels into the bag. I guess I pushed it into the back of her legs. I don't really know, I couldn't see the bag. She whirled around and growled something I didn't quite catch but it ended with "..what you're doing." Her tone was both irritated and condescending, like she was speaking to a child. I said, "I'm sorry, I couldn't see that your bag was in front of my cart" She didn't say anything, and she didn't move the freaking bag either! She just stepped forward one more step. I got really steamed. Granted, I'm sure she was inconvenienced. However, I didn't mean to bump her bag. What really griped me is that she seemed to completely ignore that anything she had done had contributed to the incident. Nor did she make any allowance for the fact that I was coping with a wheelchair and a shopping cart. I said "WOW! You don't have to be so rude about it. It was an accident and I can't see over this cart or under it. I had no idea your bag was on the floor in front of it." She completely ignored me. Her mother looked at her and gave a supercilious little smile that screamed "well we both know SHE is the rude one." I wanted to bowl her off her feet with my cart! What the Christmas holidays taught me was that a lot of the world has apparently either never given a thought to what shopping from a wheelchair must be like, or they assume that if you are in a wheelchair, your legs don't work at all. I got several surprised then instantly suspicious looks when I would use my feet to scoot my wheelchair along an aisle, or I would stand up to see something on a shelf. It's not that I cannot stand or walk. It's that I cannot do so for long. the looks I got seemed to reflect a suspicion on their part that I wasn't disabled at all but somehow using the wheelchair for some kind of ulterior motive. More than once, as I negotiated my way through a store, I got glares as if I were taking up too much of the aisle, or moving at the wrong speed. Maybe I do both those things. What floors me is the apparent expectation that I should be moving around as if I were not in a wheelchair, or stay the heck out of the stores. I am happy to report that a number of people were incredibly kind, even getting things down off high shelves for me, or offering help I really didn't need. By and large these were Asians, Hispanics, Blacks, and the Caucasians who were kind were largely not American born (I could tell because most of them had accents.) The most ITO Club members were almost completely Caucasian Americans. I'm not sure what this says, but from where I sit it certainly suggests a cultural difference in attitudes toward the disabled adults of the world. I say adults because I have never witnessed anyone behaving toward a child in a wheelchair the way they behave toward me. I will note that the lady whose bag I injured (I never actually bumped her person) and her mother appeared to be Hispanic, not of the Latin American variety, but the South American. The lady had a slight accent similar to the ones I have heard in Argentinians, Chileans, Colombians, but I could be mistaken. So it's certainly not exclusive to any group to be rude or to be kind. What made me laugh were the people who either spoke more loudly or talked in really slow, precisely enunciated sentences with very short words. I'm neither deaf nor simple-minded. Still, I give these people points for making an effort be polite and helpful. The ITO Club can kiss my rims!